Artist and designer Ishac Bertran puts LPs under the knife for a novel way to create samples. Designer Ishac Bertran has developed an analog music-sampling technique by physically cutting and pasting pieces of vinyl together to create new tracks. A passionate amateur DJ, Bertran first of all bought a collection of secondhand vinyl records from a range of artists including Supertramp, Wagner, Paul Anka, Lil Jon and a few tests records. 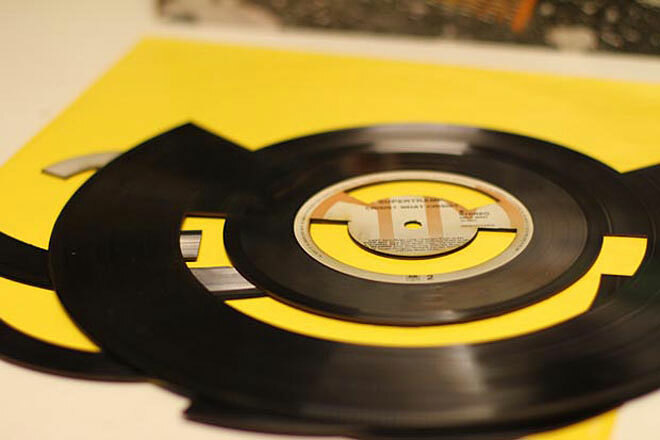 Once back in his studio, he tested a few different techniques for cutting the records to remove sections, which could then be replaced with pieces from other records. He first tried a hot wire cutter, taking a while to find a temperature that would cut the vinyl without deforming it. The aim was to remove a small section of the vinyl, flip it over, and replace it so that a sample from a song on the B side would play on the A side. He found that it was difficult to get a good fit once the section was reversed, and had to file it down. The fact that the hot wire cutter melted the vinyl meant that it left the edges uneven, which then caused the stylus to jump when the record played. Bertran then tested using a blade to cut into the vinyl. This worked a little better, but still required some filing, which in turn created a gap, which caused the stylus to jump. The final technique he tried was using a laser cutter, first of all excising small sections of the vinyl and flipping them, then cutting out larger sections and replacing them with exactly the same size section from another record. The sections were fastened into place with sticky tape. Once he’d perfected the technique, he honed it, mixing in samples from as many as four different records. If you want to hear what the resulting records sound like, check out the video documenting the process below. View Wired UK’s gallery for more pictures of Bertran’s work.